Health information management (HIM) professionals manage healthcare data and information resources. The profession encompasses planning, collecting, aggregating, analyzing, and disseminating individual patient and aggregate clinical data. A career in health information management combines the disciplines of medicine, information management, and computer technology within the health care industry. Code health information for reimbursement and research. For more information on career opportunities please visit Health Information Careers. Within the Department of Health Information Management, interested students can obtain an Associate of Science Degree in Health Information Technology or a Bachelor of Science Degree in Health Information Administration. The AS Degree professional performs a variety of technical health information functions, including the following: analyzing and evaluating health information for accuracy; compiling administrative and health statistics; coding diagnoses and procedures for reimbursement and databases; and creating disease registries for researchers. The BS Degree professional brings a unique skillset to the healthcare industry, including the following: managing electronic health records, managing clinical workflow, improving the quality and uses of data, protecting the privacy and security of patient health information, and analyzing information for reimbursement and research. and then expand from there. What can I do with a degree in Health Information Management? Registered health information administrators and technicians are employed by hospitals, ambulatory and long-term care facilities, clinics, physicians’ offices, outsourcing companies, system vendors, insurance companies, law firms, and government agencies, among others. Job opportunities include such positions as coders, data analysts in quality, registries, and electronic health record/IT areas, health information department managers, revenue cycle coordinators, quality managers, project managers, and many others. To become certified, students in the health information technology program must successfully complete IU Northwest degree requirements for an associate of science in health information technology and pass the certification examination the RHIT, administered by the national professional association, the American Health Information Management Association. To become certified, student in the health information administration program must successfully complete IU Northwest degree requirements for a bachelor of science in health information administration and pass the certification examination the RHIA, administered by the national professional association, the American Health Information Management Association. 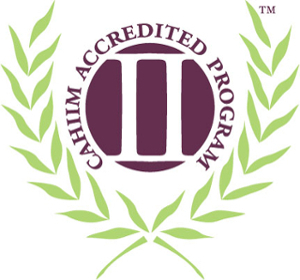 The Health Information Administration Program is accredited by the Commission on Accreditation for Health Informatics and Information Management Education (CAHIIM). Career opportunities are plentiful nationwide as both professional designation enables employment in any state.